Happy 2014! We hope you all are enjoying a good start to the new year. In honor of the new year, we would like to provide you with a few refreshers regarding our new website. When the new website went live, you may remember we did tutorials to help with navigation – there is a lot of information on there! Since then, we have made some further changes/additions, and so a bit of review seems to be in order. 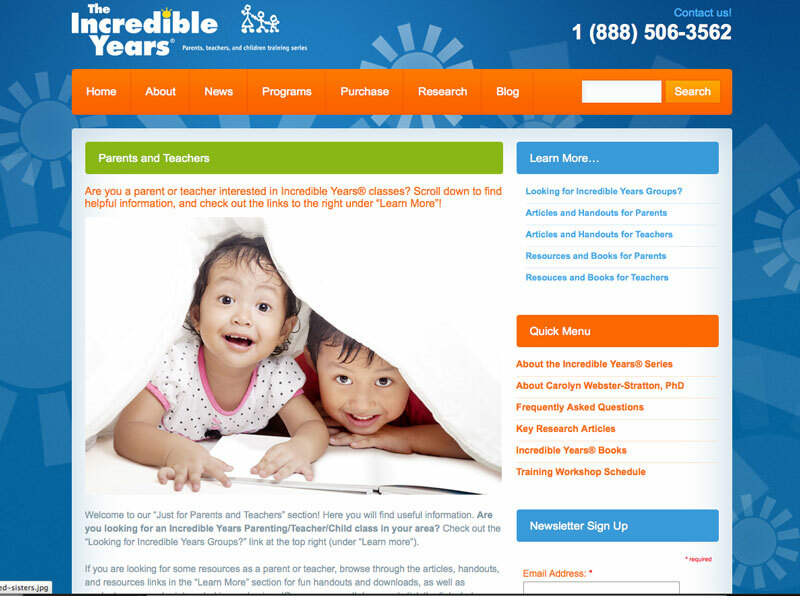 Today we will focus on the “For Parents and Teachers” section of our website. We have done quite a bit of work on this area and it’s important you know where to find everything! For Group Leaders and Mentors/Trainers, this is a really important section to refer the parents/teachers in your groups to. There are handouts, articles, and resources for parents and teachers which can be used to help reinforce concepts and further their understanding. Notice that you can access the same links by either clicking on the orange buttons (For Administrators, For Researchers, etc.) OR by hovering over the “Home” tab up top. 1. If you are a group leader, go to the white box that has the orange “IY Group Leaders” section – click on “Go to resources” to access things like handouts and forms. 2. Hover over “Programs” to find specific program information. 3. Hover over “Research” to access things like Measures/Forms and the Research Article Library. Okay – continuing on! Bring the focus back to the “Parents and Teachers” section. 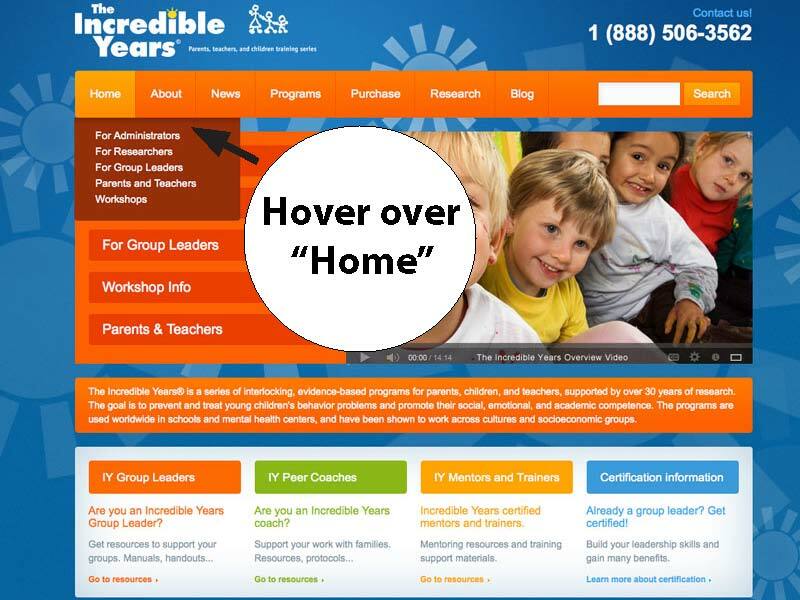 Like we said, either click on the big orange “Parents and Teachers” OR hover over “Home” and scroll down to “Parents and Teachers” (then click on it!). Take note of the right hand side of the page: “Learn More” (in blue). 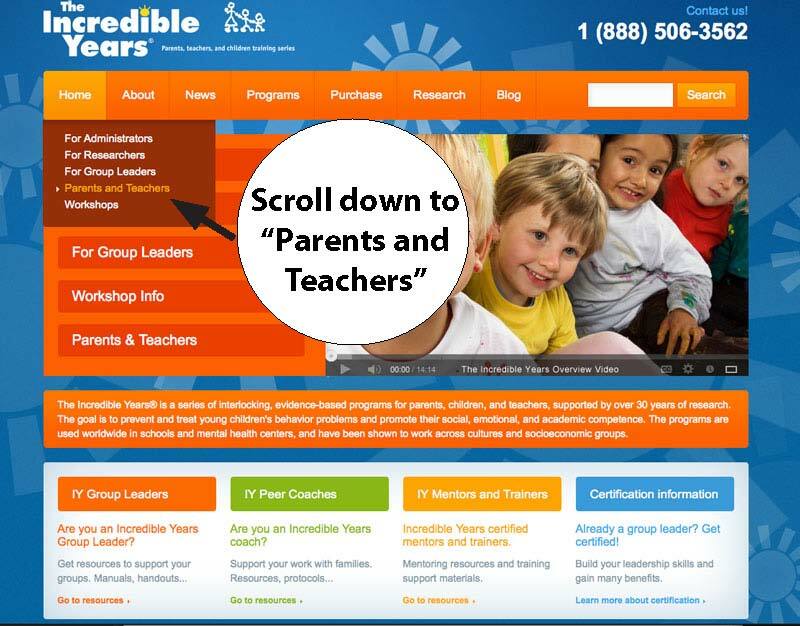 There is a list of links you can access in the “Parents and Teachers” section. You can also access the same links by scrolling down on the page. If you choose to scroll down, first you will see a blue link to click if you are looking for Incredible Years® Providers in your area. 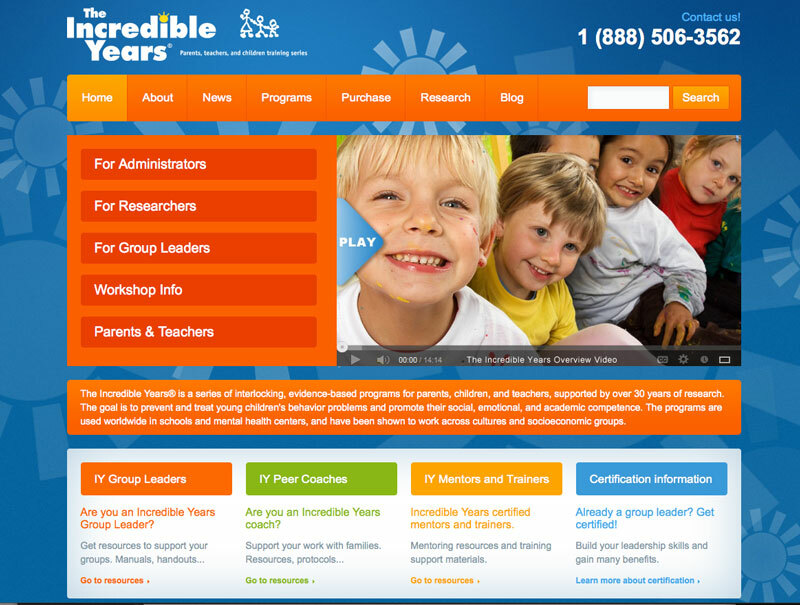 So, if you are looking for agencies that run Incredible Years parent, teacher, or child classes – click that link! (Remember you can also access it above on the right – go to “Learn More” and click “Looking for Incredible Years® Groups?”). If you are looking for articles, books, downloads and products, click the applicable link. Finally, if you are interested in watching parent and teacher testimonial videos, showing their experiences with the IY programs, click the blue link at the bottom (you cannot access this link from the Learn More section). This page is a great resource! We have just added it recently. 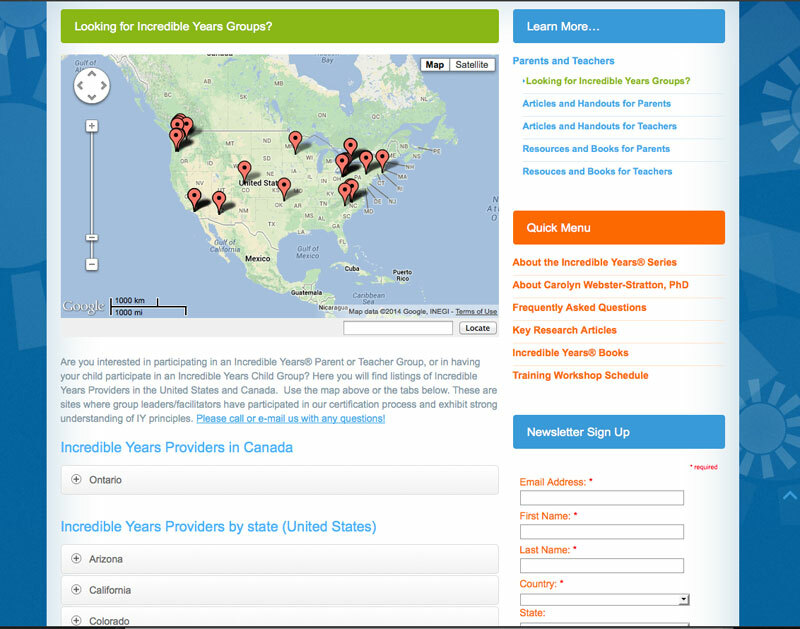 It is a compiled listing of agencies and individuals implementing the Incredible Years® in Canada and the United States. We have chosen agencies who have certified group leaders, meaning they have had further review and feedback with their use of our programs. You can find agencies by using the map (which operates just like a Google map), or, by clicking the toggle buttons below. There is more extensive information about each agency in the toggle button sections than on the map. Finally, let’s look at one of the Resources/Handouts pages. We will take a look at the page for Parents, but the same is available for Teachers. Just click the link that is applicable to you. 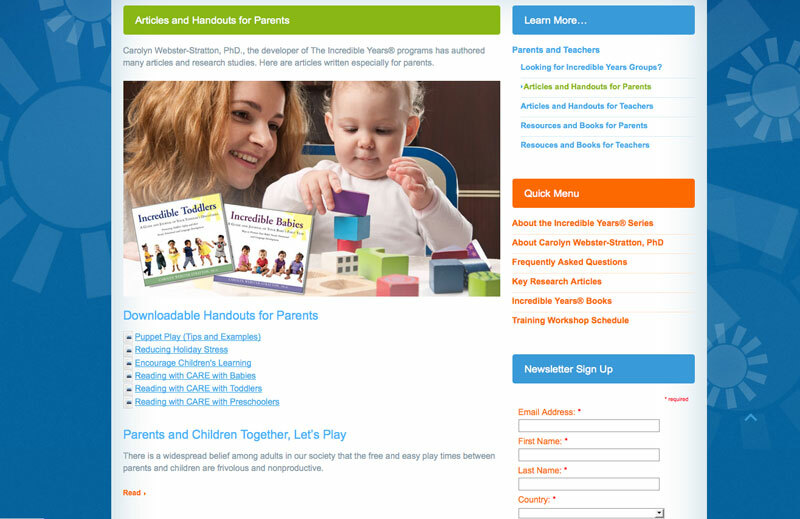 This is the page “Articles and Handouts for Parents” – which you can access from the “Learn More” section. This page provides free downloads for parents. There are handouts and articles written by Carolyn Webster-Stratton, Incredible Years® Developer. 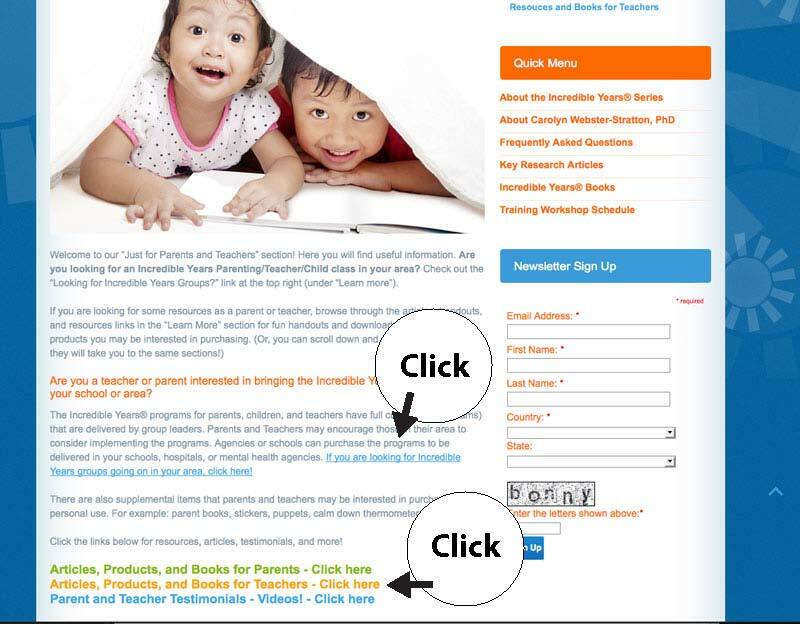 Lastly, If you go back to “Learn More” you can also click on “Resources and Books for Parents” which will take you to a page where you will see products that parents and/or teachers can purchase to use with children. We will be posting a few more tutorials over the next couple of weeks – please let us know if there is anything in particular you would like us to cover! Looks like some great changes have been made, can’t wait to see some more tutorials from you guys!